iWeb Review 2019: Is iWeb a Good Hosting? 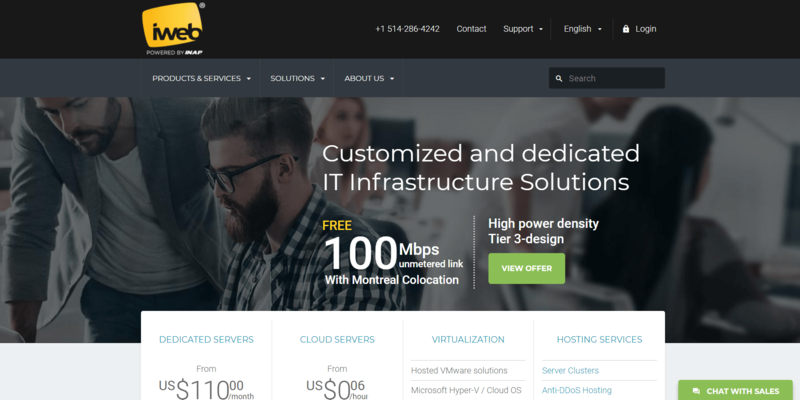 iWeb was one of the first internet infrastructure providers in Canada and now offers an enterprise-level service with globally located data centers and all of the support services you need to launch and run a enterprise-grade server-as-a-service solution. iWeb is proud of the fact that they were one of Canada’s first internet infrastructure providers when they were founded in 1996. They have used that headstart to stay ahead of the industry and continue to be one of the leading providers for server-as-a-service solutions. iWeb now has a global presence with data center facilities in Montreal, Dallas, Singapore, Amsterdam, California, and New York. They are also partnered with some of the biggest names in the industry like Microsoft and Intel. As a global company with customers from 150 countries, they provide their services in English, French, and Spanish and have an intensive global peering network. iWeb focuses on top-of-the-line dedicated server and public cloud hosting for medium to large businesses. As such, they don’t offer any basic web hosting as well as most of the features and services you associate with it like domain registration and basic SSL certificates. iWeb provides powerful hosting products that are hard to find elsewhere and include a number of hybrid cloud solutions and specialized infrastructure virtualizations. The quality of the data centers themselves is another strong reason to go with iWeb. Few other providers have the guts to offer a blanket 100% uptime SLA-backed guarantee. And, they make use of top-of-the-range technology and standards thanks to their partners like Microsoft, Intel, OpenStack, and SolidFire. SSD storage is provided by SolidFire SSD disks, CPUs consist of the latest generation Intel Xeon processors, NAS or SAN dedicated block storage is available. Networks come with load balancing and ports of up to 10 Gbps, and all resources are available in massive quantities. The latest Windows and Linux distributions and software is always used. Their extra services are also extremely valuable. You can purchase ultra-reliable cloud backup for your servers, extra Websecurity and CDN packages via Imperva Incapsula for firewall and DDoS protection, and extra Rapid Response Monitoring services for your servers. iWeb has all of the terms of service and policies in place to ensure that their customers feel confident in signing up with them. On top of a 30-day satisfaction or your money back guarantee, they also offer reimbursement of 1% for every six minutes of downtime up to 100% of your fees as part of their 100% uptime SLA. They offer a wide range of configurations for dedicated server and cloud hosting products. Single processor: Five configurations with 8GB to 64GB RAM, 1TB to 4TB storage, and 30TB to unmetered bandwidth. Dual processor: Seven configurations with 64GB to 512GB RAM, 4TB to 16TB storage, and 30TB bandwidth. Performance: Seven configurations with 64GB to 512GB RAM, 960GB SSD to 3.2TB PCI NMVe storage, and 30TB bandwidth. Storage: Three configurations with 32GB RAM and 30TB bandwidth each and 16TB to 48TB HDD, or 4.8TB SSD storage. Windows servers cost quite a bit more than their Linux counterparts. The public cloud products are also divided between Linux and Windows options with Windows being more expensive. Rental of cloud servers is charged on an hourly basis. All plans include unlimited traffic and 100 Mbps public connection bandwidth. To choose a plan, you combine the CPU cores and RAM with the storage you need. 1 vCPU/1GB RAM, 2 vCPU/2GB RAM, 3 vCPU/3GB RAM, and 4 vCPU/4GB RAM can be combined with 50GB, 200GB, or 250GB SSD storage. iWeb prides themselves on friendly, efficient, and available technical customer support. They deliver on the latter promise with 24/7 phone, email, ticket, and live chat support to all of their customers, no matter what plan you’re on. With on-site technicians, they take a very proactive approach to finding and solving issues before customers even notice them. They also provide a very complete knowledge base as well as policies and terms documents for your own reference. Although iWeb is not your typical web host where you’ll find affordable and straightforward shared web hosting, they are a superb internet infrastructure services provider for enterprises all over the globe with world-class data centers and a global network. They can also cater to all needs on a custom basis by contacting them. Wondering how iWeb stacks up against other Web Hosting companies? Enter any other Web Hosting company and we will give you a side-by-side comparison.